NASHVILLE – An incorrect electronic file submission sent to TennCare’s system caused information for some enrollees to be sent to incorrect addresses statewide. Approximately 3,900 enrollees were affected when letters and cards that contained one or more pieces of personal information were sent to incorrect addresses. The error was the result of a modification to the system that pulls addresses into an electronic file for TennCare. An error caused by the system modification corrupted the file. Although there is no evidence that this information has been improperly accessed or misused in any way, TennCare is providing all affected enrollees one year of free comprehensive identity theft safeguards provided by Kroll Inc. that includes continuous credit monitoring, as well as enhanced identity theft consultation and restoration services. Enrollees whose personal information was affected will be notified by mail the week of February 22. Included in the mailing to affected enrollees, will be the type of information that was disclosed – such as name, date of birth, and Social Security number – and detailed information on how to sign up for Kroll’s identity theft safeguards that are being offered. The identity theft services are offered to affected enrollees free of charge. Enrollees need to review the mailing to understand the type of services offered, sign up for the free services, and check their credit report on a frequent basis. A dedicated call center will be available Monday through Friday, 8 a.m. to 5 p.m. CST, starting Monday, February 22, for enrollees who have questions about the mailing. The call center, operated by Kroll Fraud Solution Customer Service Specialists, will be able to answer further questions about the incident, and provide additional details about the identity theft safeguards being offered. The number for the call center is 1-877-309-0010. 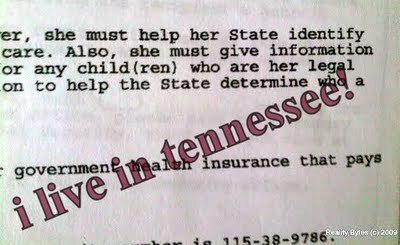 Basic information about the mailing is available on TennCare’s Web site www.tn.gov/tenncare. Personal information of the affected enrollees was immediately corrected in the system, and the information was re-mailed to the correct addresses. 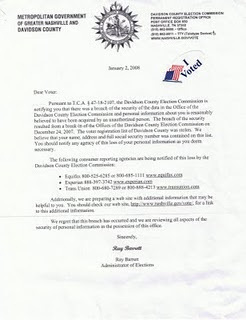 Enrollees who received an incorrect mailing are urged to simply leave the letter or card in its original envelope and write “return to sender” on the outside of the envelope. No postage is required. TennCare and the Department of Human Services, which helps provide eligibility determination services, have reviewed and strengthened the protocol to help safeguard against this type of system error. In the future, these file transfers will undergo more intense analysis and testing to ensure that accurate data is sent..
TERMINATED. YOU COULD BE NEXT. Thank you for your message about reforming the process for determining eligibility for Social Security disability benefits. I appreciate hearing from you, and I certainly understand your interest in this matter. This is an issue related to the federal government rather than state government. Unfortunately, as Governor, I do not have the ability to intervene in the operations of the federal government. Your comments would be more effectively addressed to your elected federal representatives: the President, one of our two United States Senators, or the Member of Congress who represents you in the United States House of Representatives. I am confident that they would welcome the opportunity to respond to your concerns. I appreciate your willingness to bring this matter to my attention. As I continue to work for policies that are effective and beneficial to the people of Tennessee, I hope you will feel free to contact me whenever you have problems, suggestions or concerns related to state government.